In many of the places where CNEWA works, there are prisons. Most have appalling conditions; many are places where hope is in short supply. 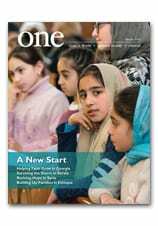 The March 2018 issue of ONE, CNEWA’s magazine, chronicles the work of prison chaplains in Ethiopia who are seeking to change that. While this story is, of course, unique, it is replicated by committed Christians all over CNEWA’s world — and, in fact, the whole world — who are responding to the Gospel mandate to visit the imprisoned. This story offers us an opportunity to reflect on where that mandate originates, and why it matters so much. To begin with, prisons appear several times in the Bible. In the New Testament, John the Baptist is imprisoned and ultimately executed by Herod. In the Acts of the Apostles, Peter and John are imprisoned several times as is Paul. In fact, in his letter to the Ephesians Paul describes himself twice as a “prisoner of the Lord.” However, perhaps the most important appearance of prison is in Matthew 25. In his description of the Last Judgment, Jesus harshly condemns those who are “on the left side of the Son of Man.” He condemns them: “Go away from me, with your curse upon you, to the everlasting fire prepared for the devil and his angels” (Matt 25:41). This is one of the harshest statements of Jesus in all the Gospels. When he explains why these people are cursed, he notes they did not feed the hungry, give drink to the thirsty, welcome the stranger, clothe the naked and visit the sick. These are actions which we would expect of a follower of Jesus, especially after he makes them quite literally the linchpins of salvation. What is interesting is that Jesus not only includes visiting the sick but also visiting the imprisoned. The seriousness of this cannot be overlooked. Visiting the imprisoned is for Jesus here a condition for salvation. Since the time of Jesus, prisons have evolved — though, to be honest, rarely improved. In the ancient world, a prison was basically the place where criminals where held until they we executed, sold into slavery, etc. Imprisonment itself was not the punishment but merely the place where one was held before punishment. In the Middle Ages, imprisonment itself became a punishment. The ability to execute and imprison people was a sign of power and authority and many a nobleman had a dungeon in his castle where people were held in the most degrading conditions. In the 18th and 19th centuries in England and among the Quakers in Pennsylvania a new concept of the prison evolved. These reformers saw imprisonment not merely as a punishment but as rehabilitation. Prisons became “correction facilities,” where the criminal would repent, reform and return to society as a productive, law-abiding citizen. While a noble idea, it didn’t get very far; centuries later, prisons are horrible places where a “correction facility” far too often releases people who arefrequently no better — and often worse — than when they were initially incarcerated. Recent popes have been increasingly concerned with the plight of the imprisoned. After years as “prisoner of the Vatican,” the first pope to leave the Vatican was Pope John XXIII. On 26 December 1958 the pope’s first excursion out of Vatican City was a Christmas visit to the prisoners at Regina Cœli, the notorious Roman prison on the Gianicolo. Since that time, popes have regularly visited the imprisoned. Pope Francis has made Holy Thursday the traditional day for such a trip, traveling outside the Vatican to celebrate the Holy Thursday liturgy and wash the feet of prisoners. He is modeling for us what Christ taught — and embodying in a powerful and modern way the very message of Matthew 25. We are privileged to follow that example in our own work. Supported by CNEWA, prison ministers — very often lay people — are bringing hope and a future to people who otherwise would not have it. Based on a deep conviction that people can change, that grace is more powerful than sin and goodness more powerful than evil, prison ministers help the imprisoned turn their lives around and ultimately return to society. Earlier this year 2018, Pope Francis approved the proposal presented by the Synod of the Melkite Roman Catholics to transfer Bishop Joseph Jbara from the Diocese of Our Lady of Paradise in Sao Paulo to the Greek Melkite Catholic Archeparchy of Petra and Philadelphia. He thus became an archbishop. Archbishop Jbara visited CNEWA’s office on 31 May. His visit was a gesture of love and thanks to all who attended his installation ceremony in April. I briefed him on all our projects and programs involving the Melkite churches and parishioners, and was privileged to give him a tour at our community center.